"A note from Dr. Sara: When you read Personal Paleo Code by Chris Kresser, and try to reconcile the Paleo Diet with T. Colin Campbell's The China Study and/or Joel Fuhrman's Eat to Live, you're likely to get increasingly confused by the conflicting opinions. I'm delighted to present Brian Rigby's rigorous synthesis of where we stand on the meat/cancer connection and the latest literature on IGF-1, which was posted recently on Peertrainer. As usual, the truth is not so simple. Let Brian put the pieces together for you, so you can make your own decision regarding a simple question: Is meat bad?" This article takes a deep dive into the complex truth about the IGF-1 connection to cancer and heart disease. The quick answer to this question is 1) no, meat and animal protein does not necessarily “cause” cancer, and the truth is much more complex. And 2) IGF-1 is a critically important hormone that can be good or bad depending on the context. IGF-1 is one of our body’s most important anabolic hormones. Anabolic hormones are in charge of growth, and growth can be both good or bad depending on context. Animal protein raises IGF-1 more than other foods, but this doesn’t mean meat is bad for you, or is “as bad as smoking cigarettes” as some headlines have proclaimed. When IGF-1 levels are too high, some forms of cancer grow more easily (mainly prostate and breast). However, when IGF-1 levels are low, risks of cardiovascular disease, dementia, Alzheimer’s, and sarcopenia are all much higher. In fact, death to cancer is also much more common with low IGF-1 too, possibly due to increased risk of cachexia (muscle wasting). While diseases associated with high IGF-1 levels are scary, the truth is that low IGF-1 levels are more likely to be of concern for many people. If you are worried about IGF-1 levels, perhaps the best action you can take is to exercise frequently. Frequent exercise cuts the risk of cancers associated with IGF-1 to a much greater extent than cutting animal protein does, and also doesn’t predispose you to the diseases associated with low IGF-1. In fact, the risk of all of the diseases associated with low IGF-1 are also reduced when you exercise frequently. We encourage you to read the entire article below. It’s long, but you’ll get loads of great information about exactly what IGF-1 does, how it affects our health, and how we can be sure do IGF-1 “the right way”–the way where we live a long, strong, disease-free life! 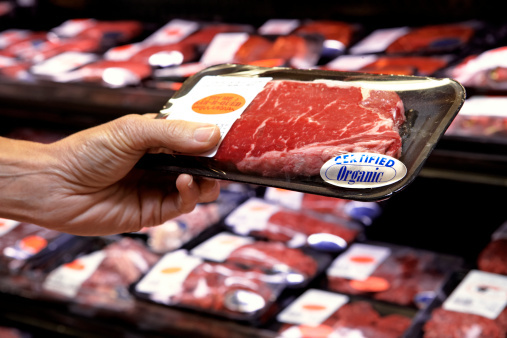 IGF-1: Does Meat Cause Cancer? IGF-1 stands for “insulin-like growth factor 1”, and as the name implies, it performs a similar sort of job as insulin. Most people know that insulin is related to blood glucose, and maybe that insulin helps the body move that glucose into different organs (such as the muscles or the fat). We usually think of insulin being released in relation to a high-carbohydrate meal, but in reality both carbohydrates and protein are well-capable of raising insulin. IGF-1 release is more complicated, with multiple interactions with other hormones such as growth hormone, but ultimately it appears to be correlated with animal protein intake (particularly dairy) and also fat intake. Since carbohydrates can increase insulin, and insulin can affect IGF-1, there is some correlation with carbohydrates, but overall it doesn’t appear to be as strong as the correlation between animal protein and fats. What most people don’t realize is that insulin is actually our body’s #1 most important anabolic hormone! Briefly, we can divide our body’s metabolism into two camps: anabolic reactions, or reactions that build something, and catabolic reactions, or reactions that break something down. We need both of them, and depending on the context, both can be highly positive or incredibly damaging. We can’t say that insulin or IGF-1 are completely good or completely bad–depending on the context, they can be extremely helpful or potentially harmful hormones. For example, if you just trained hard, then you want anabolic reactions to occur because that’s how your muscles grow. In this case, insulin brings glucose and amino acids into the muscle and encourages muscle growth. On the other hand, if you’ve been sitting at a desk all day and have a giant pile of fries for lunch, you haven’t stimulated the right conditions for anabolic reactions to be favored in the muscles. Instead, you’ll build your fat cells—not the result most people are looking for. Both the muscle-building process and the fat-storage process are anabolic reactions, but one is generally considered to be positive and the other negative. On the far end of the spectrum, a cancer cell grows via anabolic reactions. Ultimately, we can’t say that insulin is definitely good or definitely bad; we can only say that depending on the context, it may promote health or harm. Optimally, you want to do everything you can to encourage insulin’s healthy effects, not its harmful effects, but sometimes it’s not such an easy distinction to make! Molecularly, IGF-1 is very similar to insulin, and is similarly anabolic. IGF-1 helps children develop physically into adults, and it continues to help adult cells to grow and divide. Without healthy levels of IGF-1, children fail to develop properly, resulting in dwarfism, and adults lose muscle mass and suffer from overall weakened strength. The main point here is that context is highly important when it comes to discussing IGF-1—it’s not as simple as saying that IGF-1 is good or that it’s bad. When IGF-1 is helping the muscles adapt to exercise, it’s good, whereas when IGF-1 is helping cancer cells to divide and develop a blood supply (angiogenesis), it’s bad. This context is why it’s so important to consider lifestyle along with diet when approaching IGF-1, and why we need to take some of the sensationalistic headlines with a grain of salt. The short answer to this is “no”—IGF-1 doesn’t cause cancer, though it may allow cancerous cells that already exist to grow faster. Even this process is somewhat more nuanced than people who strongly link IGF-1 and cancer would have you believe. A meta-analysis of studies examining the correlation between high IGF-1 levels and different cancers only found increased risk of prostate and pre-menopausal breast cancers, suggesting that perhaps it’s premature to say that high levels of IGF-1 would predispose someone to cancer. There are many more cancers, and many more deadly cancers, that did not appear to be highly correlated. A second meta-analysis observed that men with low IGF-1 levels actually had significantly higher risk of death due to cancer than men with normal (not high) levels. In this case, no studies involving cancer risk and IGF-1 in women were included, so we cannot assume the same will be true in women–though we might expect it to be similar given our knowledge of how IGF-1 affects the human body. At most, what we can say we relative certainty is that having high levels of IGF-1 may increase your risk of developing breast or prostate cancer. What we cannot say for certain is that low levels will decrease your risk above and beyond simply aiming for normal levels—in fact, as just mentioned, research actually shows a greater risk of death due to cancer when IGF-1 levels are low, possibly because of cancer-induced cachexia (muscle wasting often seen in cancer and other chronic diseases). Cancer is associated with both high levels of IGF-1 and low levels! What they found was that even though protein intake was by far the highest in the endurance runner group, IGF-1 levels were NOT the highest in the runners. The group with the highest IGF-1 levels was the SAD group, suggesting that we can’t blame protein alone for high IGF-1 levels—we need to look at lifestyle too. Furthermore, IGFBP-3 was actually the lowest in the endurance group (though overall there was no significant difference). Even though the group of endurance runners ate around 200% the protein as the calorie-restriction group, IGF-1 was actually highest in the middle-of-the-road SAD diet. So it comes back to context again—who’s at higher risk for a disease associated with high levels of anabolic hormones: an athlete who will use those hormones to develop stronger muscles, or a sedentary individual who isn’t creating the conditions needed to grow muscles and in whom IGF-1 will mostly feed unhealthy processes? When we examine the context, it’s easier to distinguish between when we might worry about high IGF-1 levels and when we might assume it’ll be beneficial. This still isn’t the whole picture, though. We need to understand how else IGF-1 affects disease beyond just cancer, because as it turns out, cancer is actually only a fraction of the picture! Cancer is a scary disease, but cardiovascular diseases (CVD) consistently outrank all cancers combined as the leading cause of death in the United States. When examining the relationship between IGF-1 levels and CVD, we actually witness an inverse relationship, meaning that risk of CVD increases as IGF-1 decreases. Studies in rats show that when rats are fed a heart-damaging diet extremely high in fat, the rats with low IGF-1 levels suffered more and greater ill effects from that diet than the control rats with normal IGF-1 levels. Not only do the IGF-1 deficient rats have increased blood glucose levels and impaired ability to clear glucose from the blood (problems associated with diabetes), but they also had significantly higher inflammation, which is coming to be understood as a root cause in CVD! In humans, we’ve witnessed that IGF-1 is directly beneficial on a number of factors involved in CVD risk. IGF-1 reduces oxidative stress on the blood vessels, reduces the number of blood vessel cells that die, reduces inflammation, and improves the stability of plaques already formed, making them less likely to cause dangerous clots that can cause problems like strokes. In this way, keeping IGF-1 levels normal protects against CVD and CVD mortality. Cardiovascular disease is the #1 killer of both men and women in the US. Being in the bottom 20% for IGF-1 levels dramatically increases your risk of death due to stroke and heart attack. Beyond playing a role in keeping our cardiovascular system in good shape, IGF-1 also protects the brain. One way it does this is by helping to control something called “hippocampal neurogenesis”—essentially, growing new cells in the hippocampus, a region of the brain which is heavily involved in both short and long-term memory. Maintaining high levels of hippocampal neurogenesis helps the brain stay “plastic”, or flexible and able to learn. Increased IGF-1 levels appear to improve cognitive function in the elderly. It’s possible that declining IGF-1 levels play a significant role in the loss of mental function frequently associated with aging! When rats are injected with IGF-1, hippocampal neurogenesis actually increases, and cognitive impairments are reversed. One hypothesis for why stress can cause cognitive impairment (and ultimately lead down the road towards diseases like Alzheimer’s and dementia) is that cortisol (the stress hormone) impairs IGF-1 production, lowering serum levels and affecting hippocampal neurogenesis. When elderly mice are given IGF-1 replacement therapy, cognitive function improves, learning and memory are improved, and neurogenesis is increased. They also develop more blood vessels in the brain, and utilize blood glucose better. In essence, mice who have their IGF-1 levels artificially increased ‘recover’ from the cognitive declines we generally associate with “just getting older”. While we can’t necessarily expect to see the same results in humans, we do have data that suggests that IGF-1 levels are inversely associated with both Alzheimer’s disease and dementia. The higher your IGF-1 levels, the lower your risk of these specific cognitive disorders. It’s not a big leap to expect overall cognitive function to be better in elderly individuals with higher IGF-1 levels. Growing old doesn’t just bring cognitive decline, we often witness a decline in physical health as well. Bones become more brittle and muscles start wasting away, and IGF-1 plays a protective role against these facets of aging as well! Men with low levels of IGF-1 had a 45% increased risk of hip fracture for every decline of roughly 50 ng/mL. At around 150 ng/mL, the association becomes insignificant, indicating that IGF-1 levels above this level are unlikely to be protective. Higher IGF-1 levels also predicted a lower loss of lean muscle mass in aging men. Sarcopenia, a condition where the muscles begin to waste away, becomes more and more common as you grow older, in part due to declining IGF-1 levels. When muscle is lost, so is stability and ability to provide yourself with care, causing a decrease in quality of life and potentially increasing risk of injury or death due to complications from falls. Perhaps the most common refrain from people seeking to convince you that lowering IGF-1 levels is a healthy idea is that in some species, IGF-1 is inversely related to longevity—that is, when IGF-1 levels are lowered, the animals live longer. Unfortunately, this association simply doesn’t hold true in humans. To begin with, humans are significantly more complicated than the species this association has been found in, such as nematodes and fruit flies. Whereas mammals typically have receptors for IGF-1 in many organs (meaning that many organs are affected by IGF-1), the simpler organisms typically only have IGF-1 receptors in their nervous system. The importance of this is that whereas IGF-1 might only affect a single pathway in a simpler organism, in mammals it will affect numerous organs and pathways, potentially in different ways for every different receptor, and not all of them helpful. In other words, even if IGF-1 is harmful to one system, it might be completely necessary to a different system; it’s not as if you can selectively choose which system will get the IGF-1! This is why low IGF-1 levels are actually correlated with increased risk of death, not decreased risk—despite what science shows with nematodes and fruit flies. Men in the bottom 10% of IGF-1 levels have an overall 38% greater risk of death (though by the 20th percentile, the association disappears). To put it bluntly, longevity only matters if you don’t die of other causes. It doesn’t matter if you could have lived to 120 if you die of a stroke at 72, or if at age 84 you break a hip and die due to complications. Even if lowering IGF-1 levels could potentially extend the clock on our life, it also ironically increases our risk of dying from other causes—not a great trade-off! In fact, low IGF-1 levels may not even be associated with longevity in humans at all. One study showed that the female offspring of centenarians had significantly higher levels of IGF-1, though they also had reduced IGF-1R levels (a receptor that IGF-1 binds to in order to cause an effect). The researchers hypothesized that the higher IGF-1 levels may have been the body’s way of compensating for reduced receptor activity, but the result is the same: IGF-1 was higher, not lower, in the female offspring of individuals who lived to be at least 100 years old. It also demonstrates that when our body has errors in one system, it typically compensates with another, making it challenging to actually predict the effects of changing hormonal levels on longevity and health. Changes almost never happen in isolation! A study just out this month looked at overall risk of mortality associated with protein intake and IGF-1. What it found was that between the ages of 50 and 65, risk was increased in people who ate a protein-rich diet, whereas in people over 65 years old experienced a decrease in mortality. There are a number of flaws in the study, and we are limited in what we can really interpret from it, but overall it paints the same basic picture as the rest of the data discussed above. Exercising frequently is much more important for cutting cancer risk than cutting meat intake. Former female collegiate athletes had only 16%the risk of pre-menopausal breast cancer compared to non-athletes. Death due to breast cancer occurs most frequently in women aged 55 – 64. 66% of cardiovascular disease deaths occur in individuals aged 75 and older. Sarcopenia and cognitive decline occur more and more frequently as you age, with these disorders being uncommon below age 65. To put it succinctly, the diseases associated with high IGF-1 levels kill you before age 65, whereas the diseases and disorders associated with low IGF-1 levels kill you after age 65. Does this mean we should avoid meat between the ages of 50 and 65? No! One problem with this idea is that we assume that these diseases only begin after a certain age. In fact, CVD, sarcopenia, dementia, and Alzheimer’s all develop over time, and cutting protein intake sharply for 15 years will almost certainly speed up their development. In the end, it’s context that is important again. One of the flaws of the above study is that it never looked at important lifestyle data such as how much the individuals exercised. Exercise is an extremely important means to reduce mortality, regardless of cause. Furthermore, exercise of all types reduces IGF-1 levels, attenuating any risk a high-animal-protein diet might cause. As mentioned before, you have to consider which anabolic reactions you’re feeding. If you exercise frequently, chances are good that the anabolic reactions you’re favoring are the ones which will help you develop stronger muscles, not the ones which will increase cancerous cell growth and fat deposition. A high-protein diet is unlikely to feed cancer in an athlete, even if it does increase IGF-1 levels. Research has shown that former collegiate athletes (who presumably have continued to exercise) have only about 60% the risk of breast cancer as non-athletes. In athletes under 45, risk of breast cancer is 16% that of non-athletes! With this in mind, it seems apparent that IGF-1 is, at best, only one factor involved in the risk of death associated with IGF-1 levels and animal protein intake. It also seems apparent that risk can be effectively mitigated by exercising frequently. Finally, it’s useful to put the risk of death from all these diseases in context. It’s somewhat macabre to look at the data this way, but the truth is that the diseases (prostate cancer and breast cancer) most associated with high IGF-1 levels cause a total of roughly 69,000 deaths every year. By contrast, the diseases and disorders associated with low IGF-1 levels cause 594,000deaths every year. That’s over 8.5 times as many deaths! Don’t be afraid to eat meat. You’re more likely to develop a much more life-threatening or quality-of-life-decreasing disease from too low IGF-1 levels than too high. Grass-fed and wild meats are generally the best sources of protein. Be sure you exercise. Without even looking at IGF-1 levels, former athletes had a 40% reduced risk of breast cancer. Pre-menopausal former athletes had an 84% lower risk of breast cancer compared to non-athletes, which dwarfs the 65% increase in risk in pre-menopausal breast cancer associated with high IGF-1 levels. If you get diagnosed with breast cancer or prostate cancer, it may be appropriate to take steps towards lowering IGF-1 levels, under your doctor’s discretion. At this point, talk of ‘risk’ becomes meaningless because the disease is already present. Outside of a cancer diagnosis, there is no reliable evidence that lowering IGF-1 will reduce your risk of death or disease. Some evidence suggests that low IGF-1 levels present a significantly greater risk of death and disease than high levels. Just remember to exercise, because when it comes to IGF-1 levels, diet may determine how much IGF-1 your body produces, but exercise will determine what you do with it. Why Should You Eat Your Veggies with Your Meat? Here Are a Few Reasons! One of the biggest problems with the “meat causes cancer (or heart disease, or anything else)” association is that the data we rely upon to make these sorts of judgements is confounded (statistics word for “confused” or “obscured by”) by many other factors that frequently go hand in hand with high meat consumption. Consider this: the average American diet is very high in protein, especially red meat (at least when many of the studies were conducted), which by itself may seem to imply that meat is the cause of the chronic diseases many Americans suffer. However, the typical American who follows such a diet also fails to exercise regularly, doesn’t eat the recommended amount of fruits and vegetables, consumes starches and grains primarily in a processed form, eats significant amounts of excess sugar, and in some cases is a smoker, current or past. How do we tease out where the blame really lies? By itself, it’s challenging; even though many studies attempt to control for confounding factors, it’s difficult to be certain that a particular factor bears a certain amount of blame in isolation. In other words, we have to understand not only how individual factors affect risk, but how factors mixed with other factors (and other factors beyond those) affect risk. Is meat bad for you, or is it only bad for sedentary smokers? Does exercise protect you against cancers in all cases, or only when mixed with a good diet, or only significantly when mixed with a less-than-good diet? These are difficult questions to answer! Thankfully, it’s not really necessary for scientists to answer these questions to make reasonable recommendations in the meantime because we understand enough about what is always good in our diet to protect ourselves against what may be bad (or neutral). Vegetables (and fruits) are far and away the best dietary method to protect yourself against the risk which may or may not be associated with meat. As an example of how fruits and vegetables can offset the potentially negative effects of meat, consider the link between meat and osteoporosis. Meat is rich in protein, and protein is formed of chains of individual amino acids. Of particular concern to some researchers is the fact that meat is rich in sulfur-containing amino acids, which they hypothesized could inadvertently cause the formation of sulfuric acid in the blood (very, very small amounts), which would slightly acidify the blood. To counter this acidification, our body has buffering systems, one of which is the bones. To counter the acidification, the bones would (hypothetically) release calcium which would then re-alkalinize the blood to appropriate levels (a pH of roughly 7.4). This association is no longer considered to be significant, as more studies have since been released that show that protein actually increases bone health, not decreases. Nonetheless, the consumption of vegetables with meat nullifies this problem whether it plays a significant role in the development of osteoporosis or not. Vegetables contain naturally-occurring buffering compounds (alkaline ash) which effectively neutralize any acidifying components of food. [Note: Regardless of diet, our body keeps blood pH very tightly regulated at around 7.4--aside from some small potential effects on the skeletal system, aerobic energy metabolism, and urinary pH, there is no significant effect of pH itself on health.] Furthermore, one thing every nutritionist, dietitian, diet guru, and nutritional scientist can agree on is that vegetables are good for you. Even when studies find an association with one factor and disease (such as meat and cancer), they often also find that individuals with diets highest in fruits and vegetables have the lowest rates, suggesting that vegetables are the critical factor for health, not that other factors like meat are by themselves a cause of poor health! Brian Rigby Brian Rigby CISSN is a performance nutrition specialist and current Master's Candidate in Nutrition. He applies his nutrition expertise to his writing in order to clarify complex topics and unlock understanding.Brian holds an internationally-recognized certification in sports nutrition and owns a practice in Boulder, CO which counsels athletes about the relationship between nutrition and performance.